Deceased March 3, 1993, Los Angeles County, California. We were looking at the Riverlet and found that we have an article about Lynn's death which I assume Jim's mom gave us since she was living in RR in 1983.It's long, so I will only transcribe the relevant parts of it. "An actress and drama teacher who graduated from RRHS has died on the West Coast. 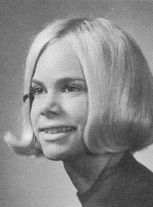 Lynn Bennett, who was a 1967 graduate of RRHS, died of a drug overdose in a Los Angeles motel on March 3. She was 44. Her husband, Michael Thoma, died of cancer several years ago." (Then there is a paraguraph about Thoma who appeared in Fame.) Then, to return to the article: "Miss Bennett, who acted under her maiden name, began her acting career at Lakewood's Beck Center, the Clague Playhoiuse in Westlake and the Huntington Playhouse in Bay Village. She left the Cleveland area in 1973 when she won a scholarship to the West Coast branch of the American Academy of Dramatic Arts in Pasadena where she met Thoma. After graduating in 1976, she performed in plays in Los Angeles and later returned to the academy to teach. Not countin on show business as her only career, she enrolled at the UCLA, receiving bachelor's and master's degrees in family counseling. Her only survivor is a sister...."